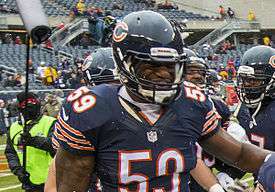 Christian Jones (born February 18, 1991) is an American football inside linebacker for the Chicago Bears of the National Football League (NFL). He was signed by the Bears as an undrafted free agent in 2014. He played college football at Florida State. Jones attended Lake Howell High School in Winter Park, Florida. He recorded 326 tackles during his career. A five-star recruit, he was ranked as the second best outside linebacker in the country by Rivals.com. As a true freshman in 2010, Jones played in all 14 games, recording 18 tackles and three sacks. As a sophomore in 2011, he started all 13 games, recording 56 tackles and three sacks. As a junior in 2012, he started all 14 games and led the team in tackles with 95. He nearly entered the 2013 NFL Draft, but decided against it. As a senior in 2013 he was suspended one game for violation of team rules. He recorded 56 tackles with 7.5 tackles for a loss, one interception and two sacks. On May 10, 2014, Jones signed with the Chicago Bears as an undrafted free agent. Despite being rated highly, it is believed he went undrafted because he failed a drug test at the NFL Combine. He had 42 tackles and 2 sacks in five starts in his rookie season. On January 3, 2016, Jones recorded 5 tackles and a sack against the Detroit Lions. His father, Willie Jones, also played at Florida State and played for the Oakland Raiders of the National Football League. ↑ "Lions vs. Bears - Box Score - January 3, 2016 - ESPN". ESPN.com. Retrieved 2016-02-20.